BEHOLD: THE BACONATOR AS A PURSE. OUR PARTNER SUGARDALE HAS CREATED AND DONATED 10 CUSTOM, HAND-MADE SWAROVSKI CRYSTAL PURSES TO BE AUCTIONED OFF IN SUPPORT OF THE DAVE THOMAS FOUNDATION FOR ADOPTION. Believe it or not, when Dave Thomas founded Wendy’s in 1969, bacon wasn’t on the menu. That’s right – our beloved Baconator® wasn’t introduced until 2007 – a whopping 38 years after our founding – followed by the popular Son of Baconator® in 2012. Now, you probably thought bacon was always on the menu because the bacon we use encompasses everything that’s good about Wendy’s – fresh and flavorful. But the moral here is that quality takes time, and finding a quality partner can take even longer. And when you know, you know. Though it took us a while to create those two bacon-topped culinary masterpieces, Dave – always a leader in quick-service restaurant industry innovation – was thinking about putting bacon on hamburgers long before Baconator made bacon-lover’s dreams come true. Dave had friends at Fresh Mark, the parent company of Sugardale Foods that’s been making bacon for almost 100 years. Fun fact: Sugardale representatives personally delivered the first eight cases of bacon directly to Dave at a Wendy’s in downtown Columbus, cooked it with Dave and tested it on a hamburger in 1982. Did you also know 1982 is the year we introduced our first bacon cheeseburger? For 36 years now, Sugardale has supplied our bacon, and they’re great partners to our international business, as well. And, just like our hamburgers are made from fresh, never frozen beef*, our bacon is made from fresh pork bellies that Sugardale cuts and packages for team members to cook daily in our restaurants. But to Wendy’s, Sugardale is more than just bacon. Sugardale is also a proud supporter of our brand charity of choice, the Dave Thomas Foundation for Adoption. Sugardale has supported the Foundation since its inception in 1992 and continues to us help find permanent, loving homes for children in foster care by sponsoring Wendy’s annual Frosty 5K Run for Adoption, various golf tournaments, and our annual Wendy’s Convention. Like we said: when you know, you know, and Dave’s instincts were right on with this partnership. 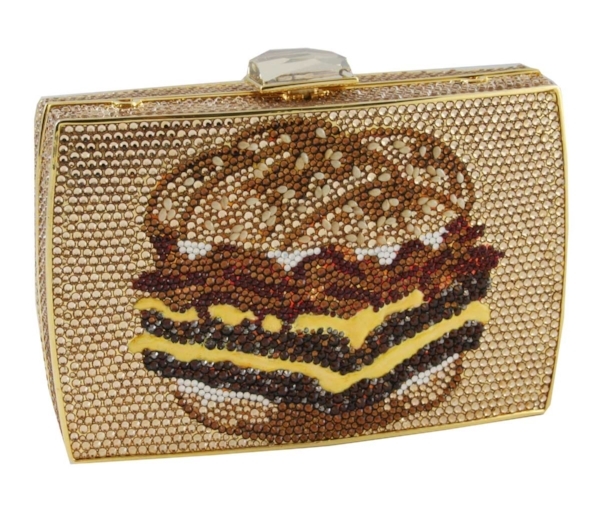 Sugardale has also created and donated 10 custom, hand-made Swarovski crystal purses – designed to honor the Wendy’s brand – to be auctioned off as part of an annual fundraiser. The purses alone have raised over $500,000 for the Foundation, to which Dave would have said, well done! In 2016, Sugardale hit the road and brought their bacon food truck (you read that right – bacon food truck!) to our Restaurant Support Center in Dublin, Ohio. They’re here today for the third year in a row with their very own Sugardale hot dogs and a toppings stand (yep, bacon and Wendy’s chili are both offered as toppings) to serve lunch and fundraise for the Dave Thomas Foundation for Adoption. Who doesn’t love a hot dog lunch for a good cause? Thank you, Sugardale, for all you do for Wendy’s and for children in foster care. We hope our partnership brings many more bacon-topped treasures to Wendy’s fans for years to come! * Fresh beef available in the contiguous U.S., Alaska and Canada.